We offer a limited pick up and delivery service within the Toowoomba boundaries for a minimal fee. Please advise on booking if this is required and if you need us to bring a loan cage. We are able to provide bathing, clipping and grooming services on application. Please request pricing and availability as required. These services can be provided while your cat is boarding or at some other times but bookings are essential. Where administration of medications are required, subject to the ease of administration, we will administer medications as required. However, if your cat requires 2 people to manage the task safely, then there will be a small fee per administration of medication. 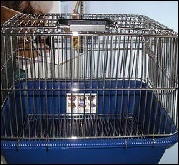 Sturdy plastic base / metal top carry cages. They come with a grate in the base of the cage. Top opening for easy access. Small side access also. These are available for just $35. Check the quality for yourself. We also have AIRLINE APPROVED PP20 ‘s for $60. Just ask. We have a small range of quality scratching poles available most of the time. Have a special request? We can order them for you as well. Strong and long lasting - just the thing to keep your furr-person from scratching where they shouldn't! KITTER TRAYS AND LITTER - New to the market place! We also stock Kitter Litter tray systems as well as the litter to go with them - in 15kg bags. Discounted prices so check with us to purchase the wonderful Kitter products - when only the best will do! 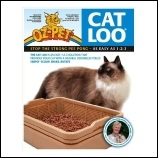 We stock OzPet Litter tray systems as well as the litter to go with them - in 15kg bags. Discounted prices so check with us to purchase the wonderful OzPet products! WE ALSO HAVE A RANGE OF FLEA TREATMENTS AVAILABLE AT COMPETITIVE PRICES. We also have some combs and toys - feather teasers and more. We are slowly building our range of products so that you can be sure you can find just what you are looking for. Any suggestions? Please let us know and we will see what we can offer.